By the time we have had snow drops, then daffodils then wild garlic we know that spring has finally arrived, and what a relief! The Clocks have gone forward and we can start dreaming of picnics in the park, while pulling on our wellies and trudging down to the woods following the distinctive scent of garlic. Although wild garlic smells like garlic, it does not look a bit the same, it has long green leaves with pretty – and edible white flowers, and you wouldn’t bother with the bulb at all as far too small. The leaf itself packs a punch, pretty fiery to be honest but becomes softer once cooked, imagine the texture of cooked spinach. The season for wild garlic is short and sweet, over by June which comes with a welcome break after over-doing it slightly with the recipes – a bit like Rose in the summer, by October you never want to see another bottle again. But we are not at that stage yet so we are having it with every dish, it goes hand in hand with eggs, fantastic with creamy scrambled (add spring onions, chilli, herbs and cheese), an omelette or a frittata with young asparagus and spring onions. It nicely pairs with other spring dishes like lamb or salads in a dressing. One of the most common is wild garlic pesto which we always make and is a fun take on the original – it also freezes well. We make ours with wild garlic, olive oil, parmesan, chilli, basil and then add avocado which gives it a luxy creaminess and is really good in a chicken sandwich. 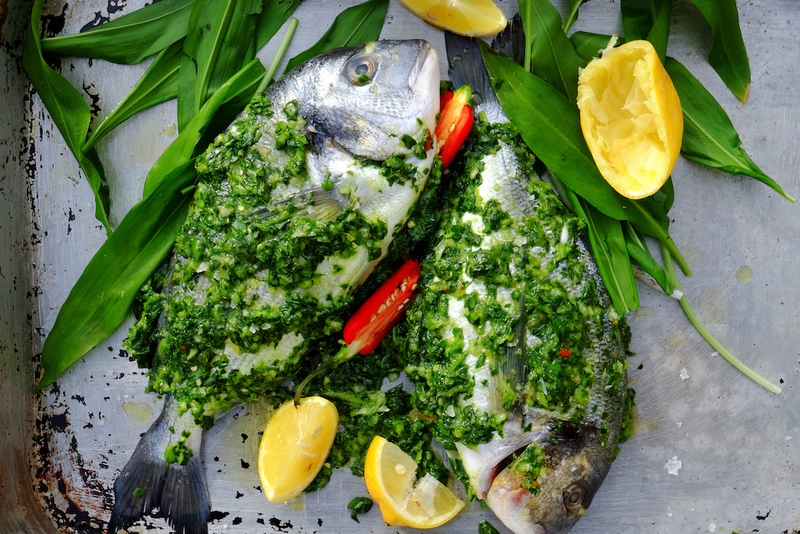 You could use any white fleshed whole fish for this recipe, we have gone for Sea Bream. The fresher the better, look for clear eyes which will give you a good indication of its freshness. Ask the fishmonger to gut and descale it. Once home massage it with olive oil and salt and pepper and place it in a pan and your already half way there. A good quality fresh fish is best served simply rather than bells and whistles. We often just stuff them with lots of bay leaves and garlic and roast them quickly in a hot oven. Nice to do on the bbq (fingers crossed for the bank holiday weekend) but put it in a special fish holder to make life easier. This recipe couldn’t be easier, a great one for the holiday weekend if you are out on a long walk – keep you eyes peeled for the wild garlic! Serve with a simple new potato salad and some homemade mayonnaise. 1. Preheat the oven to 220.c 2. Whiz the wild garlic, parsley, basil, lemon, spring onions, olive oil and salt and pepper together in the food processor, or finely chop and combine. 3. Place your two fish in a roasting tin and drizzle with olive oil and salt and pepper and rub in. With a sharp knife score the fish 3 times, cutting just though the skin. Pour over the marinade and rub into the skin and into the cavity. Cover and refrigerate for at least an hour. 4. Uncover the fish, stuff with a few more wild garlic leaves and scatter with chili and lemon if you wish. Pop in the oven for about 20 minutes, till the skin is starting to crisp and the flesh is opaque. Serve straight away.